The deluxe champagne and donut gift set includes three bottles of exquisite champagne including Moët & Chandon Imperial Brut, Moët & Chandon Imperial Rosé and Veuve Clicquot Yellow Label Brut and Pink Box Gourmet Donuts for next day delivery in Las Vegas, Nevada. The perfect treat for the office, Las Vegas Tourists, and just to say thank you! Pink Box Donuts are a voted Best of Las Vegas! If you would like to design a custom donut, please contact 702-214-1221. The deluxe champagne and donut gift set includes three bottles of exquisite champagne including Moët & Chandon Imperial Brut, Moët & Chandon Imperial Rosé and Veuve Clicquot Yellow Label Brut and Pink Box Gourmet Donuts for next day delivery in Las Vegas, Nevada. The perfect treat for the office, Las Vegas Tourists, and just to say thank you! 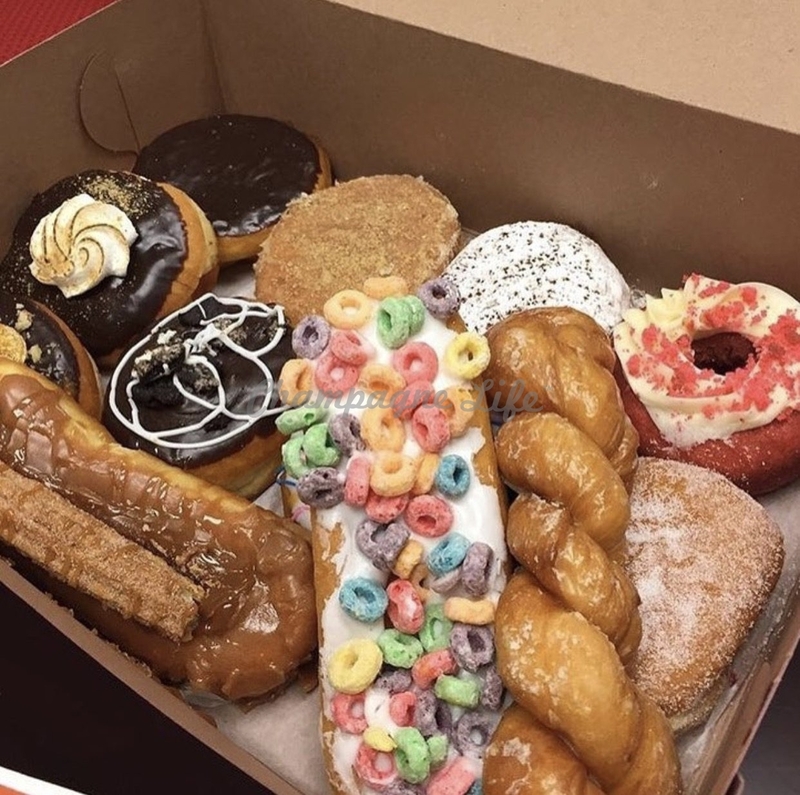 Pink Box Donuts are a voted Best of Las Vegas! For other delicious catering options, check out our Cake & Cupcakes and Donut Gifts. Please allow 24 hours for delivery. All Birthday gift baskets and Donut gifts are available for delivery to all hotels and casinos on the Las Vegas Strip, Las Vegas Residences and Las Vegas Businesses. Champagne Life will gladly design a custom gift for you, please complete the custom gift order form. Be sure to check out our most popular Champagne Gifts and Birthday Gifts. Champagne Life is proud to be Las Vegas #1 Gift Basket Company since 2013. If you are looking for donut delivery to las vegas strip, you have finally found it!